Access your idyllic luxury wilderness camp where guided snorkelling, kayaking and bush walks are just some of the activities available. Take your front-row seat at one of the most biodiverse reefs in the world, Ningaloo Reef. Fly over Cape Range National Park to your luxury wilderness camp. Come face-to-face with incredible marine life. Swim with whale sharks (Apr-Jul) or spot humpback whales (Aug-Oct). Welcome to W.A.’s sun-soaked capital. Transfer to your stylish boutique hotel. Transfer to airport for the flight* north to Exmouth. 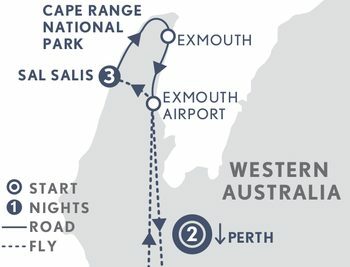 Then, an exhilarating 20-minute scenic flight over the limestone plateaux of Cape Range National Park to Ningaloo Reef. Your base is the exclusive Sal Salis, a safari camp just steps from the shore. Savour sunset drinks and dinner overlooking the world’s greatest fringing coastal coral reef. Explore the reef which is home to a dizzying array of sea life. Between April and July, head out by boat in search of the majestic whale shark. Snorkelling with these incredible giants is the experience of a lifetime. Between August and October, spy humpback whales on their migration south to Antarctica. Relax with a gourmet lunch and spot dolphins, dugongs and manta rays. Activities are seasonal and weather dependent. A free day to further explore the Cape Range National Park on a guided hike, snorkel the turquoise waters of the reef, or simply relax. Transfer back to Exmouth Airport for the return flight* to Perth. Transfer back to the hotel and spend the rest of the day exploring the city’s hidden treasures at your leisure.